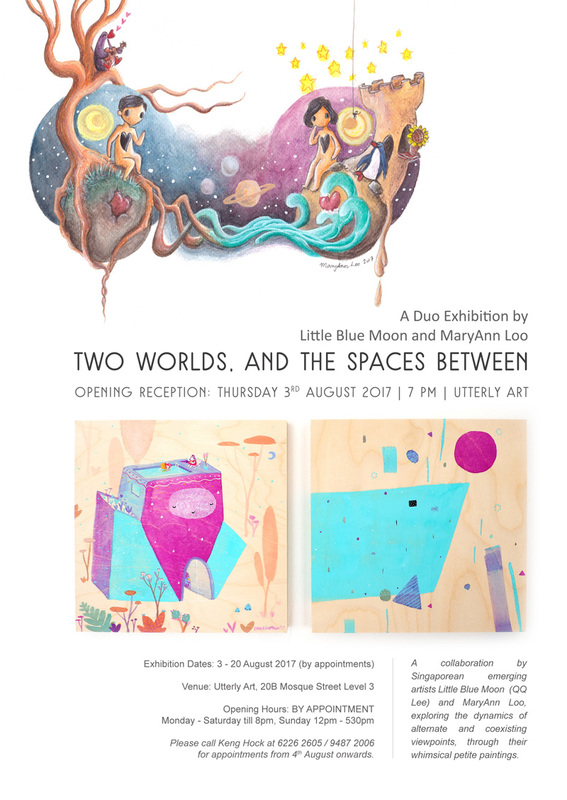 Two Worlds, and the Spaces Between is their first duo exhibition, and a presentation of viewpoints to art forms and storytelling. QQ Lee (also known as Little Blue Moon) finds the spaces between things alive and constantly changing. She presents Two Worlds as multiple pairs of artworks, opening up an open-ended 'Space' between the audience and her works. The pairing of narrative and abstract paintings explores how formal elements of an artwork can be contrasting, and yet harmonising. On another level, her narratives present alternate viewpoints to our world through the eyes of small beings residing in natural or imagined habitats. QQ enjoys exploring the ever-changing moods of nature, geometry and their relationships. Moods and colours captivate her. There is a sense of enigma and inquisitiveness in her works, as if one is being invited to pause and linger in that moment. She enjoys observing things for a long time, and appreciating the subtle nuances, which are translated into the elements in her paintings. She believes there is no one way to interpret her works. It inevitably involves the viewers' thoughts, drawing from their life experiences, and meshing it up with what she presents. She hopes that others find peace and treasures of the heart through engaging with her works. For most of her life, MaryAnn Loo has dreamed of her own epic love story, rewriting and reimagining it based on her circumstances and inspired by movies, fairy tales, and romance novels - fantasy relationships that never turn out the way she wanted them to in reality. In her latest series of narrative watercolor paintings, MaryAnn draws inspiration from her romantic experiences, and expresses them as whimsical stories of separateness, longing and connection. Through the symbolic use of natural elements, planets, and figures, MaryAnn provides a space for viewers to acknowledge their separateness from others, as well as the longing to connect and feel complete in love. At the same time, she hopes to challenge their perspective and look beyond the illusory nature of romance to embrace love and connection in their truer forms.